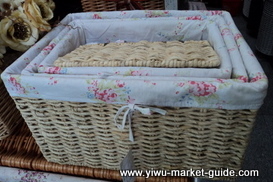 Buy Wicker Laundry Baskets And Storage Baskets From Yiwu, China. 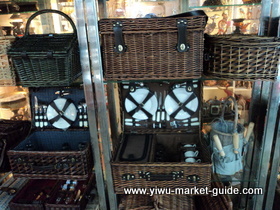 The aim of this article is to provide solid information to buyers who plans to buy wicker laundry baskets and storage baskets from Yiwu China. 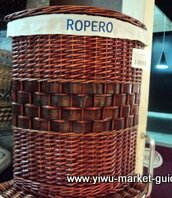 There are about 30 suppliers are currently trading wicker laundry baskets and storage baskets, I can’t list all of them here. You can evaluate the potential offered by this market, by these limited information. 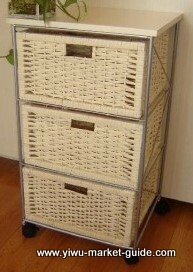 Unlike the massive sections for many other products, wicker laundry baskets and storage baskets is pretty small here. There are about 30 suppliers are in this business. Most of the showrooms are on Floor 3 & 4, District one of the main market - futian market. A few more shops are in district 4. These shops are wholesaling either on behalf of their own factory(a large part are from Shandong province), or on behalf of other factories they represent. 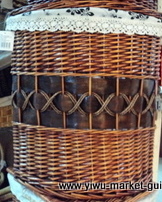 Full wicker, 3 pcs a set (the other 2 smaller ones are put inside ), about 60cm high(the biggest),about 15.00 USD/set. 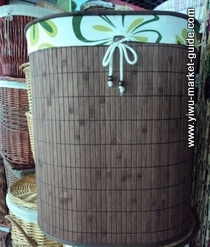 Full wicker, 3 pcs a set (the other 2 are smaller ones inside ), about 65cm high(the biggest),about 14.70 USD/set..
Full wicker, 3 pcs a set (the other 2 are smaller ones inside ), about 65cm high(the biggest),about 15.50 USD/set..
Full willow laundry basket, 3 pcs a set (the other 2 are smaller ones inside ), about 65cm high(the biggest),about 15.50 USD/set..
folding bamboo laundry basket, 50cm high,about 5.80 USD/per..
Full wicker, 3 pcs a set (the other 2 are smaller ones inside ), 45cm * 35cm * 20cm (the biggest),about 9.30 USD/set..
white laundry basket, made from corn leaves, 4 pcs a set, 40cm * 25cm * 25cm (the biggest),about 14.00 USD/set. 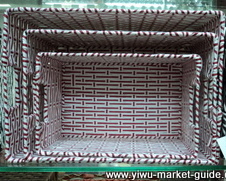 paper wire storage baskets, white and red, 3 pcs a set, 28cm * 14cm * 16cm (the smallest),about 4.00 USD/set. 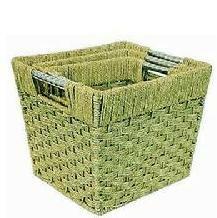 storage baskets set, made from plants, 4 pcs a set, including shelf, about 85cm(H),about 18.00 USD/set. 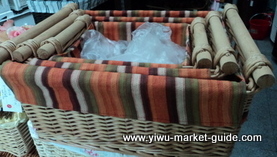 Storage baskets set, made from paper wire, 4 pcs a set, not including shelf, about 40cm * 30cm * 6cm (the middle one),about 17.60 USD/set. 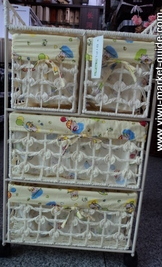 These baskets are exported to almost all over the world, mostly for low-end and mid-end market. Actually, most of them are from a same area - Shandong province. 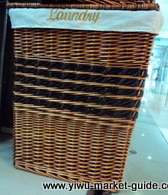 MOQ for these baskets, in most cases, is 20+ ctns. These products are bulky. And many countries require Fumigation and Quarantine Inspection for importing these products, for pest control purpose. In practical, a 20 feet container or at least half of a 20 feet container should be ordered, to meet the minimum quantity for fumigation. 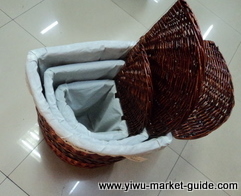 >> Return to buy from Yiwu from buy wicker laundry baskets and storage baskets from yiwu china.